Hi friends - Today I am sharing with you my entry into the current Lawn Fawnatics Challenge. 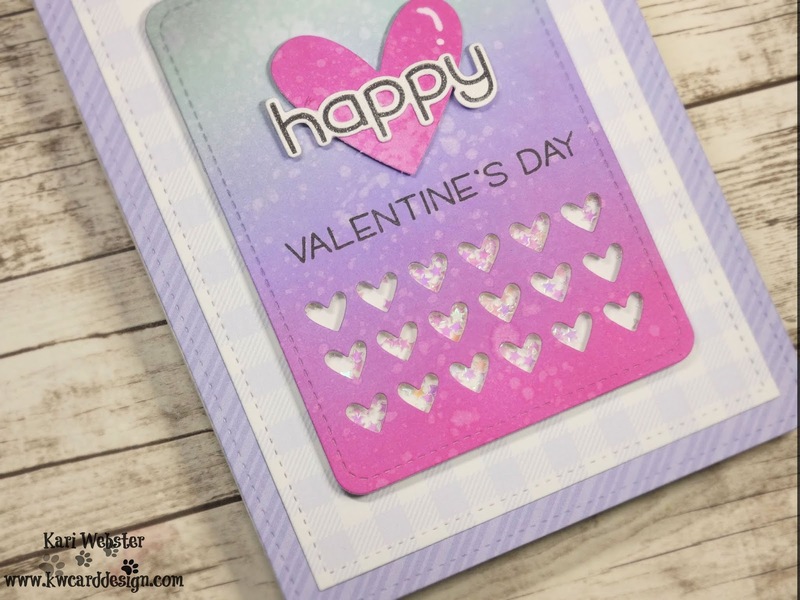 We all have Valentine's Day on the brain, and I enjoy creating cards with a Valentine theme. I will apologize now, because some of the products I used on my card are now retired from Lawn Fawn. They are some of my favorite products though, and I wanted to use them in a creative way. I started my card by using some distress inks in Picked Raspberry, Cracked Pistachio, and Shaded Lilac and inked on the colors onto some white card stock. Once I was happy with how the inking turned out, I die cut the panel using the Journaling Card die and the border heart die in the same set to create a window for a mini shaker. You know I am keeping those little hearts that were left from die cutting for another project - they are too cute and very useful! I also die cut another bigger heart a Lawn Fawn die set and inked it up with Picked Raspberry Distress ink. For the shaker, I added some double sided adhesive around the area, and added some acetate, then added some foam adhesive. For the shaker bits, I added some iridescent stars for some sparkle. Once the shaker was completed, I stamped out my sentiment using the How You Bean? Conversation Hearts Add-on stamp set since it has a nice Happy Valentine's Day sentiment in it. I also used the Happy Happy Happy Add-on set - and die cut the Happy sentiment after stamping it onto white card stock. I mounted that to my Picked Raspberry heart with liquid adhesive. To finish the card, I used papers from Gotta Have Gingham and Really Rainbow, and used my Large and Small Stitched Rectangle dies to add that finished faux stitching. Once I added my shaker to my card, I added some finally details with a white gel pen, and a bit of shimmer with my Wink of Stella. It was fun to come up with something for this challenge and use older products from Lawn Fawn. Retired or not, I still love them!